Laura U. Marks. Hanan al-Cinema: Affections for the Moving Image. Cambridge, MA: MIT Press, 2015. Hardcover. 416 pp. In recent decades Arab independent and experimental filmmakers have presented the world with some of the most distinctive artistic works through their various cinematic practices. The scholarly and close readings of these works, however, have remained less-studied. 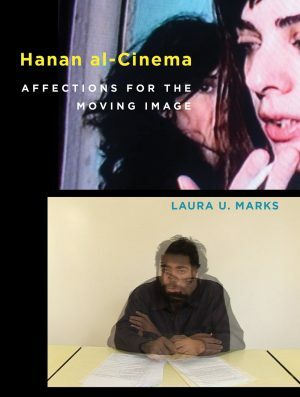 Laura U. Marks’s latest book, Hanan al-Cinema: Affections for the Moving Image, is a singular contribution in this regard, providing a thorough analysis and a historically rich account of some of the experimental films and media arts coming from the Arab-speaking world. The significance of Marks’s study shows itself not only in the uniqueness of the subjects discussed, but also in its push of the notion of experimental beyond the medium of film to “low-end video formats to HD to mobile and online platforms” (2) in terms of materiality. This new perspective to moving images challenges the conventions of narrative in order to include “experimental narrative, essay films, [and] experimental documentary” (2) in terms of content. Through a comprehensive approach, grounded in affect theory, Marks thematically (and formally) highlights the particularities of Arab experimental cinema and media arts within political, social, cultural, economic, and historical contexts covering a time frame from the 1990s to 2014. Marks argues that the modes of creativity found in the Arab experimental moving images resonate with a demand for exploration, perception, imagination, and feeling derived from “political pressures, fraught histories, divergent narratives, and competing notions of where the truth is founded and can be found” (4); perhaps in memory, in the archive, or in the body. This urge for experimentation and experience by the Arab filmmakers has created a new nahda (cultural revival) through which these artists, regardless of political and economic pressures and limitations, are creatively expressing their ideas of the world and their affections for the moving image, at the same time affecting audiences around the world. The first chapter of Hanan al-Cinema provides a panoramic discussion of infrastructures of independent and experimental cinema in the Arab-speaking countries. In this regard, creative friendships such as “connections between individuals, loosely structured local collectives, alliances that become institutions, and international networks of financial support” (25) are the basic structural part through which the artistic practices are formed. Other aspects of Arab experimental cinema’s infrastructures include: heterogeneous models of funding through various personal, national, and international sources; independent trainings and workshops developing artists’ skills and visions; emergent local and transnational cultural houses and art institutions for supporting Arab independent and experimental artists inside and outside of their countries of origin; and diverse models of distribution through non-profit distributors, galleries, Internet, and television broadcasting. The variety and complexity of Arab experimental cinema’s infrastructures point to the fact that the cinematic nahda in the Arab-speaking world is not a systematically arranged movement. As Khaled D. Ramadan and Silke Schmicki write, “It is rather a colourful mosaic of individual statements, a diversification of points of view, [and] a playful association of ideas” (8). This notion of diversity regarding the artistic expressions of Arab filmmakers is also reflected through the following chapters of the book. Instead of analyzing hundreds of films and videos in these chapters, Marks delineates the contours of the multiplicity of Arab film and media practices through the thematic essays such as “Communism, Dream Deferred,” “Asphalt Nomadism,” “Archival Romances,” and “Algorithm, Decryption, Glitch.” Also, a number of chapters exclusively focus on the works of some filmmakers, such as Elia Suleiman (Palestine), Mohamed Soueid (Lebanon), Hala Elkoussy (Egypt), and Mounir Fatmi (Morocco) in order to offer insightful introductions to these artists’ creative experimentations with moving images. Regardless of the multiplicity of creativity in Arab experimental cinema, the unfolding-enfolding aesthetics, deployed by the filmmakers, connects the diverse range of artistic representations. This aesthetics, proposed by Marks in her earlier book—Enfoldment and Infinity: An Islamic Genealogy of New Media Art (MIT Press, 2010)—is inspired by “Foucault, Deleuze, and Isma’ili Shi’ite thought” (183) and consists of three levels of experience (infinite), information, and image. This threefold connection, as Marks postulates, can be particularly useful in the reading of many artworks that discuss or represent some aspects of history and the past. “The vast majority of experience lies latent. Few images ever arise from it. In our age, those that do arise tend to be selected, or unfolded, by political and economic interests that deem them to be useful as information” (69). Yet, this particular unfolding of the past through information and image may again “slip back into the enfolded thickness of the experience” (71) and be forgotten or hidden from public imagery. The unfolding-enfolding aesthetics allows Arab independent and experimental filmmakers to un/enfold the past, particularly the historical, personal, and national ruptures and erasures. For instance, as Gaza 36mm (2012), directed by Khalil al-Mozian, depicts, many movie theaters have been destroyed or closed in Palestine due to Israel’s attacks as well as Islamist groups’ negation of cinema. Yet, the retrieval of the images of the glorious cinema days in Gaza in the film occurs through the exploration of destroyed movie places and even the enactment or staging of films that do not exist but their posters are created by the director’s collaborators, Mohammed and Ahmad Abu Nasser (better known as Tarzan and Arab), such as Fields of Thorns. As Marks asserts, “Gaza 36mm, like other movies about movie houses, deploys all the tools of memory, imagination, research, and performance with love and persistence in order to unfold images from the shadow archive” (198). In another example, Mounir Fatmi’s artworks and films, such as Arabesque: hommage à Jackson Pollock (1997) and Technologia (2010), attempt at enfolding the past or information through the symbolic use of images and the employment of techniques such as calligraphy, animated forms and letters, and diagrams in order to “draw creative power from a rejection of figurative images” (231). Laura U. Marks concludes the book with a chapter titled, “What Can a Body Do?,” in which she argues that Arab independent and experimental cinema operates through a perceptive connection between the body of the medium of film, the bodies of viewers, and the profilmic world. This sensuous interaction creates a haptic vision that resonates throughout Hanan al-Cinema: Affections for the Moving Image itself. The book puts the readers into a bodily state of knowledge and encourages them to not only intellectually engage with the discussion of some of the most impressive works of independent and experimental cinema in contemporary era, but also to align their capacities with the possibilities of artistic experimentation and visionary freedom offered by these works.